So I’m baking again these days. Lots of baking. Baking for the good of mankind! Well, maybe not all of mankind. Maybe just me, my boyfriend and his co-workers. Regardless, I’m making a difference in the world, one baked good at a time! I’m still experimenting with Banana Bread, this time non-vegan for the more traditional mass market. At Cherryvale Farms we believe in organic, wholesome living. That means better quality foods and reducing our intake or refined sugars and flours. Notice I say reducing. We don’t believe you have to remove traditional ingredients for the sake of health. Sometimes you just need to know where to pick and choose. 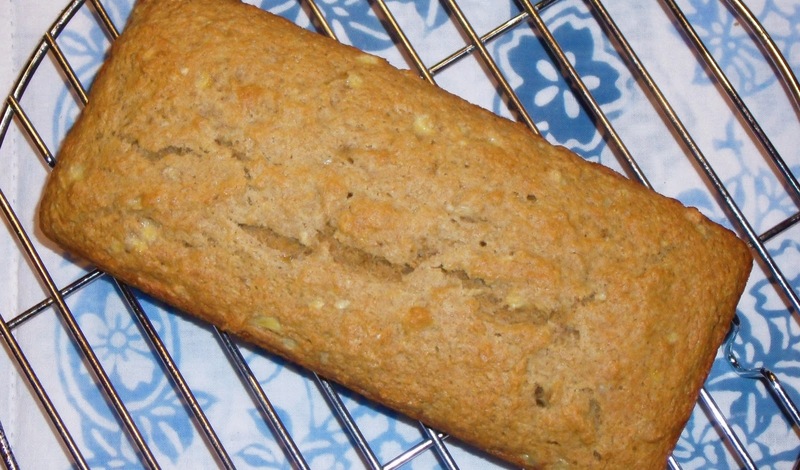 My eagerness to build a healthier banana bread is, in many ways, dedicated to Moms like my friend Catherine. She has a 13-month old baby and is concerned about the amount of sugar in kids foods. I too feel strongly about the amount of sugar we put into our family’s bodies. I have been researching a lot about the sugar substitute Stevia and I’m at a loss to figure out why the heck we didn’t start using this sooner! South American cultures have been using the Stevia plant as a natural sweetener for over 400 years and yet we’re just getting on the band wagon! Stevia has all the sweetness we look for in our processed goods without any calories and limited impact on the environment. I honestly had no idea. Consider me converted. Using 2/3 white flour and 1/3 whole wheat flour, my version also ensures your family will get more whole grains. Take a look at the final results.